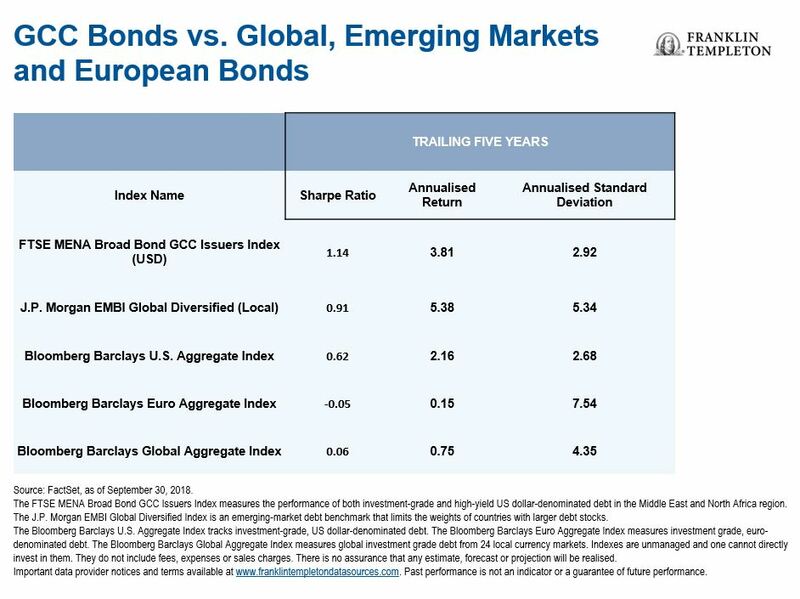 On January 31, 2019, the Gulf Cooperation Council officially joins one of the most influential emerging-market bond indices. Dino Kronfol, chief investment officer of Franklin Templeton Global Sukuk and MENA Fixed Income, believes that development could lead to billions of dollars in potential foreign investment. But it’s just one of the reasons for his optimistic outlook for the region. While a stable economic backdrop remains supportive for GCC debt, we think that perhaps the most significant event for local bonds this year is the GCC’s inclusion in JP Morgan’s emerging market bond indices.4 From late January, Saudi Arabia and four other Gulf states will enter JP Morgan’s emerging market government bond indices, bringing with it potentially billions of dollars of foreign investment. The move is significant as the indices are closely followed by international investors and inclusion should assist GCC countries in selling bonds, but also potentially help reduce borrowing costs. We expect more demand from international and local buyers to emerge this year, helping rectify what has traditionally been a chronic underweight investor stance on the region’s debt. Our view remains that cooperation between the Organization of Petroleum Exporting Countries (OPEC) and Russia will persist. Late last year, OPEC, along with Russia and its allies, reached a deal to cut production by 1.2 million barrels per day. The move helped stabilise oil prices, giving GCC government coffers a welcome fillip as well. 1. World Bank, Gulf Economic Monitor, November 2018. There is no assurance that any estimate, forecast or projection will be realised. 2. The J.P. Morgan Emerging Markets Bond Index tracks bonds in emerging markets. Indices are unmanaged and one cannot directly invest in them. They do not include fees, expenses and sales charges.